"I'm scared. Yes, me, scared! The thought of dying and never seeing Epiphany again...it actually hurts. Like the phantom ache of a missing limb. And I thought I was immune from that fear stuff. Untouchable... What's changed?" If you've ever read any of the previous adventures of John Constantine, reading that little passage probably makes you ask the same question. 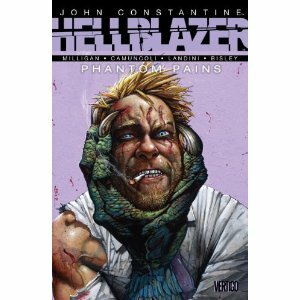 Phantom Pains is the fifth collection of comics in writer Peter Milligan's run on Hellblazer, and it nicely tells its own stories while advancing the larger plots that have been running through the title for the last few years. Phantom Pains, the five part story that takes up the bulk of the book, deals with the fallout of Constantine's recent little crazy spell in which he ripped off his own thumb and a doppelgänger was giving him trouble (all covered in previous books). As the little stub really freaks out his wife and (completely ruining a rather intimate moment that the two are trying to share), John realizes that he needs to get this sorted out quickly. Worse, Gemma Masters has a few big problems with her Uncle John Constantine due to a misunderstanding regarding the aforementioned doppelgänger, enlisting the services of some creepy tatooed women who subsequently summon a demonic harpy. In the first Milligan/ Bisley tale, a certain number-cruncher named Marcus has gotten exceptionally good at trading and investing his money. His company has grown pretty large, but he doesn't know there is a very old debt to be paid by those who use the algorithms he's been using. Constantine is around when a demon who hasn't been seen since the time of the ancient druids comes back to settle the score. Inside sends Constantine to jail, where he takes care of a demon that has been causing some problems with the prisoners. It gives Bisley a chance to draw some demented characters and serves as a nice closing chapter for the latest book in the Hellblazer series. Not enough writers get to really take their time in relating the adventures of John Constantine, and it's nice to see what Peter Milligan has been building throughout more than thirty issues of Hellblazer. His Constantine is pitch perfect, always stumbling into his next predicament, always saying the wrong thing at the wrong time, and always making it by on about ten percent skill and ninety percent luck. While you could just crack open Phantom Pains and be solidly entertained for an hour or two it would certainly be worth it to read Milligan's work on the series in its entirety. There are no slouches in the art department: Giuseppe Camuncoli and Stephano Landini handle the majority of the chores in Phantom Pains and their crisp linework tells the story nicely. Whenever Simon Bisley is involved he does tend to take the spotlight though, and it's a real joy to see his art on the two "bookends" of this collection of comics, High Frequency Man and Inside. Christopher Larochelle is buried under a huge pile of comics. At least that's his excuse for not updating his blog (where he used to write about them from time to time): www.clarocomics.blogspot.com. Visit it and encourage him to get back to updating.